It was about 3 years ago when I opened my first online trading account with COL Financial, they were referred to as CitisecOnline then, but it's been quite a while that I've been contemplating on signing up for a 2nd broker because I want to have a 2nd account to track the performance for my different portfolio constructed using a different strategy other than my personal calls. Hence the idea of opening an account either with FirstmetroSec or BPI Trade. -A caveat here however is that BPI Trade charges a PDTC Depositary Maintenance Fee of PhP 0.00000833 for every Peso of market value of your holdings as of month end and will be debited from your BPI Trade Bank Account monthly. - Take note of the word monthly. To put this in perspective, this is like 1% fee on the NAV of your positions for 100 years. Not that bad if you ask me, this should be offset on the interest you get on your cash balance. 3. Broker diversification - Just like the idea on parking your funds on multiple banks to reduce your risk in the event one of those banks go under, then same with a the online stock broker. 4. 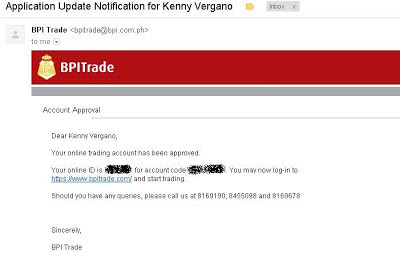 No cash out - no need to lay out cash in opening an account with BPI Trade for as long as you have an account with BPI. COL is still the best online stock broker, pero panalo din mag-open ng account with BPI Trade. Haha! I never thought of "parking" to multiple online brokers. You made a good point there, and I started considering! But I'm hearing a lot of bad things about BPI Trade despite the improvement. I am an average Filipino whose financial education is very poor and whose sole source of income is by working for a Job [that I love] but does not really pay well for all the effort that put into it. I finished literature - so you'd figure that I do not know anything about making money except for working and waiting for a pay check that comes every 15 days. I know that making money is not that easy, and understood early on during my readings about "financial freedom, investing, blogging, etc.." that you have to invest on "learning" first... I have done several readings and is pretty much aware of how some basic things about money making "work", but acknowledge that what I know is insufficient. You might find this post useful since you're starting out on investing. You can also watch some videos on youtube on how the stock market works. Khan Academy also a lot of useful videos about finance and investing that is straight forward and easy to understand. You may want to check out.